I've decided to try a WIP ,if for no other reason than to show that I do build the occasional model. I've always liked the Pucara and never thought I'd ever see one but the Falklands war changed all of that. I will be building one of the five brought back to the UK but haven't decided which one yet. Special Hobby Kit with a good reference book. Despite the box art there are no weapons or triple ejector units supplied. Kit has been well reviewed and only needs one or two modifications,the most obvious being the lack of a central fuselage pylon and the rather slim wing pylons which are missing the built in landing lights. It seems the pylons were always fitted to the aircraft and only removed for maintenance then refitted before flying again. The resin ejector seats look a bit big..more research there. Canopy comes in one piece so some careful cutting later as I want to display it open. Sorry about the rubbish pictures..I really must use a proper camera rather than the phone..pure laziness on my part though. Don't expect twice daily posts of a super fast build as it appears that now I've retired, I am required to do stuff with Mrs G! Also watching with interest. 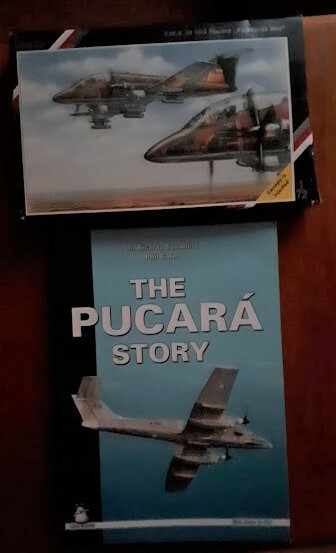 That book is brilliant, and was indispensable when I built the Aconcagua 1/48 resin kit. Were you involved in the war? Not sure if that was fortunate or unfortunate. I was a reservist at that time but was told that if a call up came it would be to a UK base to replace a regular. I'm waiting for a book a friend is sending me about the war from the Islander's viewpoint. I'll let you know the details and if you don't have it,it will probably make its way to you. A real Pucara is quite a bit bigger than one would expect,I stood up close and personal to the one that used to be in Cosford museum. A few good snaps there for you Richard. I'm in pain! Sledgehammer,concrete,me..three words not meant to go together. Despite that ,as I thought that you lot would give me pelters if I skived off again on the flimsiest of excuses, I made a start. Here's where the kit needs some attention. Very obvious detail there so I will be thinning them down a bit and adding frames and gubbins. Kit gives this as being same width as fin. It's not, so it will be cut off and new one made. Kit has too much sweep. A fillet will be added to front and faired in. The canon bulge is a bit out and could be extended slightly aft. I'm not bothering as it's not too noticeable. Centreline pylon needs to be added. Flap guides need to be added. Pylons need to be deepened a wee bit and landing lights need to be added to front. They are scribed only in kit and are not clear. There are 47 vee shaped vortex generators on each wing ahead of the ailerons. They are very small so I may cheat and just draw them on..or not. Kit seats look large and are not very accurate in the head box area. Seat is a Mk. 6 so I will use an aftermarket one with a scratch built parachute container appropriate for the Pucara. I taped the fuselage halves together and assembled the basic cockpit and taped it into the lower fuselage. This then showed me how much of the pouring stubs and cannon troughs showed and would thus need removing. This is shown in the rough black outline in the photo as is the fillet area to be removed. The pencilled area ahead of the tailplane shows the wedge to be added. That's a very kind offer regarding the book, which sounds like Graham Bound's 'Invasion 1982: The Falkland Islanders Story'. I've read it on Kindle and it's very interesting. The Pucara is looking good. Have fun! Graham Bound's book is indeed very interesting. I could only spare an hour tonight so did a wee bit of work. In the fuselage half at the top, I have started to thin down the cockpit walls and have removed the fin fillet. This has been glued inside the fuselage to act as a base for the filler for the ensuing hole. A slightly oversized wedge of scrap plastic has been glued to the tailplane. The fuselage half at the bottom shows the bits to be removed. The black line in the top half is where the fuselage side forms a lip. At the moment I am trying to keep it but may be better thinning the whole thing down and adding the lip from card later. Fortunately the plastic is quite thick but I don;'t want to weaken the front fuselage so the rib detail will be an impression rather than the exact triangular shape with lightening holes..certainly not possible by me in this scale in anycase ! My production rate is slower than glacial at times. Got another half hour in this morning. I didn't waste the time photographing a load of plastic shavings as cockpit wall thinning carefully continues. 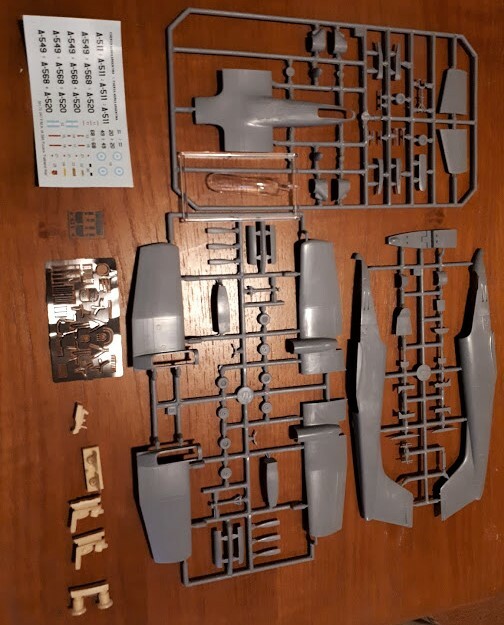 The last thing I want to do is make holes so that I am then obliged to rebuild the front fuselage with thin skin,frames and stuff like the real thing...or do I ? @goon Got any references for the ejector seats? My thoughts are of rebuilding the parachute container on a Buccaneer seat to make the version unique (?) to the Pucara. it appears that now I've retired, I am required to do stuff with Mrs G! I should think so too, a whole new world of garden centres, tea shops & farmers markets awaits, lucky you.